Welcome, sisters, to the 2017 Benedictine Spirituality Workshop and Retreat (BSWR)! 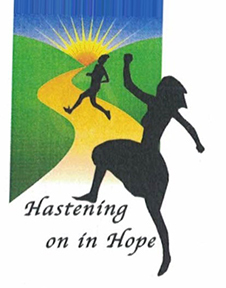 This year's theme is "Hastening on in Hope." We are honored to host this year's BSWR retreat and look forward to sacred time with the nine women who are traveling to spend the next three weeks with us as they discern perpetual monastic profession. Simply put, they have gone through the stages of initial formation and are considering what used to be called "final vows." We call this perpetual monastic profession. These sisters come from Benedictine monasteries in Arkansas, Minnesota, Indiana, Colorado, Alabama, South Dakota, and Pennsylvania. Sister Agatha Muggli, director, Annunciation Monastery, and Sister Teresa Jackson, co-director, Monastery of St. Gertrude (Cottonwood, ID) will lead these days of retreat and reflection. Several sisters of Annunciation Monastery will present on topics about the Benedictine values of prayer, community and relationships, social justice, solitude, reverence, hospitality, stewardship and a focus on monastic profession. Please pray for all who participate in this workshop. May the Holy Spirit guide each one of us as we listen and respond to God's call.